This site contains some of the presentations and technical notes of the author. Just before he left the Idaho National Laboratory (INL), United States Department of Energy, where he worked from 1991 through 1998 and was their last Principal Investigator, Nuclear Space Transport Systems. All the technical work from the 1990's on this site was paid for and supported by the United States Department of Energy, at the Idaho National Laboratory. The 2010-2011 work was commissioned by Paul Sturrock. Narrative format of the meeting. 6/24/2010 9:30:29 PM a zuppero,commissioned and paid for by Paul Sturrock. This is a sketch of a first technical analysis evaluating how much water or ice we could deliver using a bare-bones space tanker. The tanker weight is about the same as the Space Shuttle. In the sketch, we fill a water tank out in space. The location is defined in terms of the mission delta_V to go from there to here. One mission delta_V is chosen to be less than landing on the moon, and other delta-V's like landing on a moon of Mars. "Here" means to a high orbit like Earth-Moon-L5. 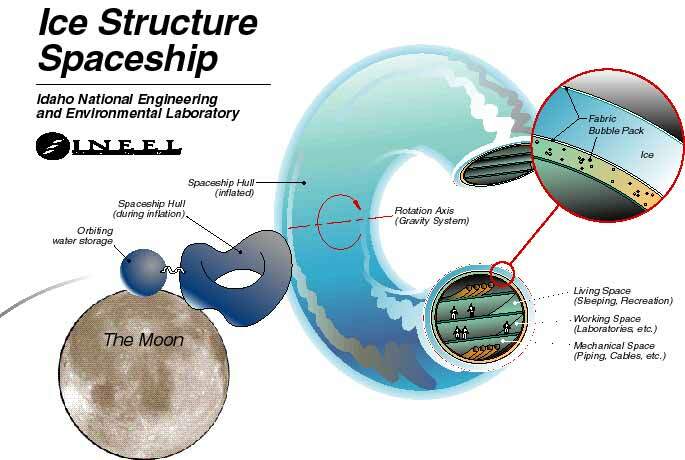 A typical Scenario: You are out in space, on the moon, trying to make the best use of water in space. Question: When you have plenty of water, just none to waste, how do you use it best? Do you use electricity and electrolysis to make hydrogen and oxygen gas? Do you make liquid hydrogn and liquid oxygen rocket fuel and use it in a known, highly reliable RL-10 family of rocket engines that really performs well? Or, do you just use it in a simple nuclear heated steam rocket, which performs poorly regarding rocket exhaust velocity, but delivers payloads in massive amounts when the mission delta_V is less than about 3 km/second? Answer: Simple wins. The original work expected to find water on the moon, and to have access tp perfected, advanced nuclear heated steam rockets. This story would have a much better ending if there were water on the moon, and especially on something with 100 times less gravity, instead of the moon. 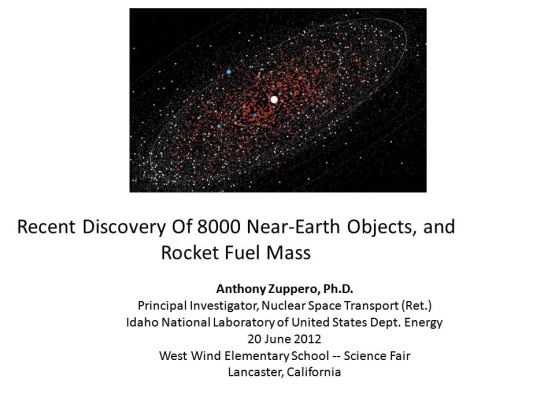 The breakthrough that makes this topic relevant is that the United States space research recently (from about 2000 thru 2011) found more than 8000 objects classified as "near Earth." (near Earth Objects, NEOs). About 1200 can be easier to get to than landing on the moon. And, the NEO's low gravity lets the landing craft launch about 100 times more weight off the NEO than launching from the moon. By comparison, the moon's gravity is "large". The technical paper tells why we thought using water as the rocket fuel reaction mass was better than using liquid hydrogen and liquid oxygen rockets for this mission. The technical paper (click here pdf) authors are Lockheed-Martin and United States Deparement of Energy people who found the key technology. HTML 3.5 Megabytes 4th Grade level, . "Computer Aided Tomagraphy, C.A.T. scan" of the Solar System, showing the comets and their dust trails, mostly between Earth and Jupiter. ...Earth is just inside the inner edge of the donut hole. 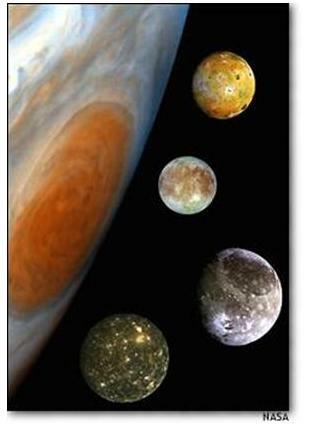 "micro-galaxy" and "dark micro-stars" are a journalistic label for Jupiter family comets and near earth objects. If it shines in the dark night sky, it is a "star". If it is too small to be seen most of the time, it is "dark". If it is too small to ignite any nuclear reactions, it is "micro". If it has low gravity, it is accessible to large landing craft. If it has water, it is "habitable". 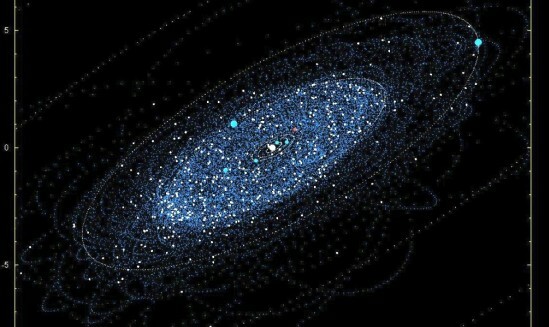 If all of these, it is a probably-habitable dark micro star. If it is also "close", then the water could be worth money because it is rocket fuel mass and rocket fuel ore deliverable to the vicinity of Earth, to a rocket fuel gas station. ... 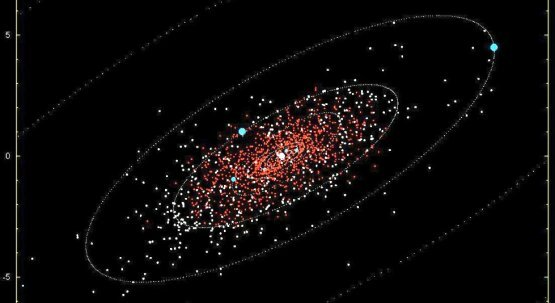 Figure 4 Perspective view of the nearly invisible, "dark micro-star galaxy" engulfing Earth on 12 April 2011 ... of where we live in the dark micro-star galaxy, containing thousands of nearby, probably habitable, nearly invisible objects mostly within 10 years travel time from Earth. mostly between Earth and Jupiter and bigger than about 1 kilometer in size and small enough to mine for rocket fuel mass and ore. This is the first description of views of the solar system generated by a digitally algorithmic hyperspectral display of rocket fuel water objects relatively near Earth. It was written for Fourth Grade Elementary School children in grade schools I have spoken to many times. A collection of raw images can be seen here but is not in professional form at all. It was put together for the pictures, not the words, and the words are at 4th Grade level. It is not even a story. This was my child-like expression exuberance at seeing the pictures we had just created for the first time, pictures of the formally nearly invisible galaxy-like picture of us embedded in our recent discovery of the water-full near Earth objects. The picture is like a medical cat scan. It is inside-out, where we are inside the CAT scan and the neo solar system is outside.
" 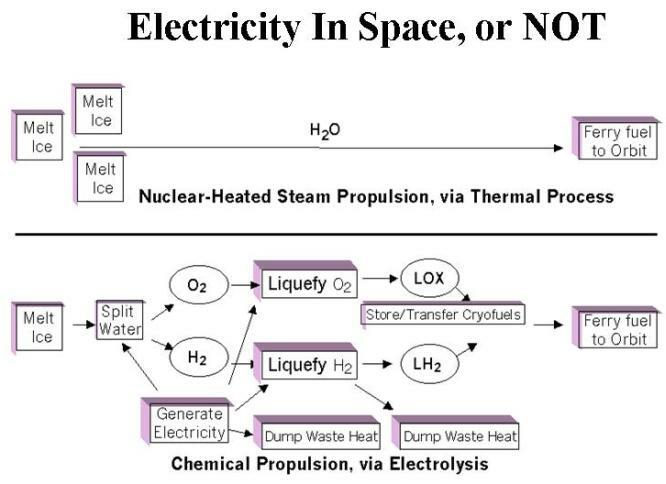 Propulsion to Moons of Jupiter Using Heat and Water Without Electrolysis Or Cryogenics "
and the report was published under the sponsorship of NeoKismet L.L.C., May 2005. Final Draft of Paper is a shorter, concise technical paper with black and white illustrations. 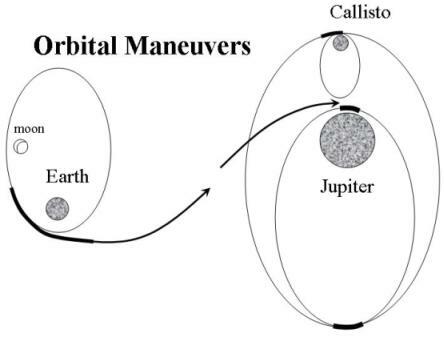 Compares a mission to Callisto using either water or liquid hydrogen propellants, and carrying along the hardware to extract water from space objects such as near earth asteroids, Earth's moon, comets and ice moons. 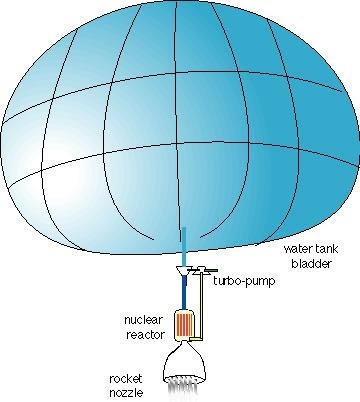 short paper on water pump needed for steam rocket. 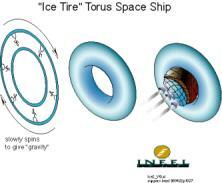 injecting water into the walls of a big plastic bag shaped like a huge donut or tire makes a space ship. no astronauts need to walk around it trying to fasten bolts and parts. Just repair holes. from the moon's North or South poles and into orbit around the Moon. i want to do crystal momentum quasimatter reactions. It might not be science fiction.